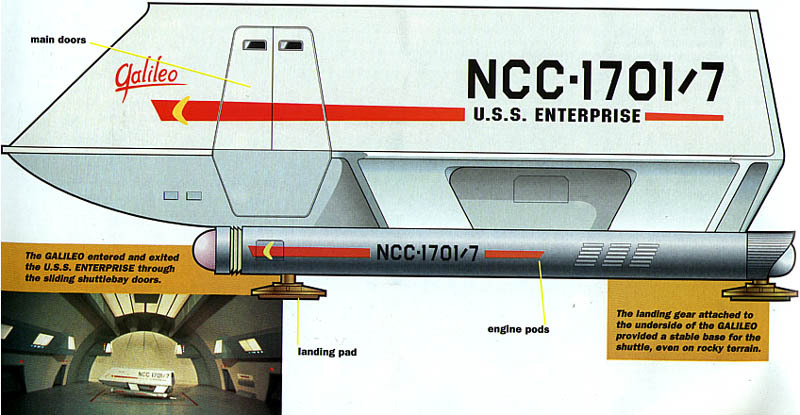 The Galileo was assigned to the original USS Enterprise NCC-1701. Its capabilities were limited, but the shuttle could provide a useful alternative to the transporters. 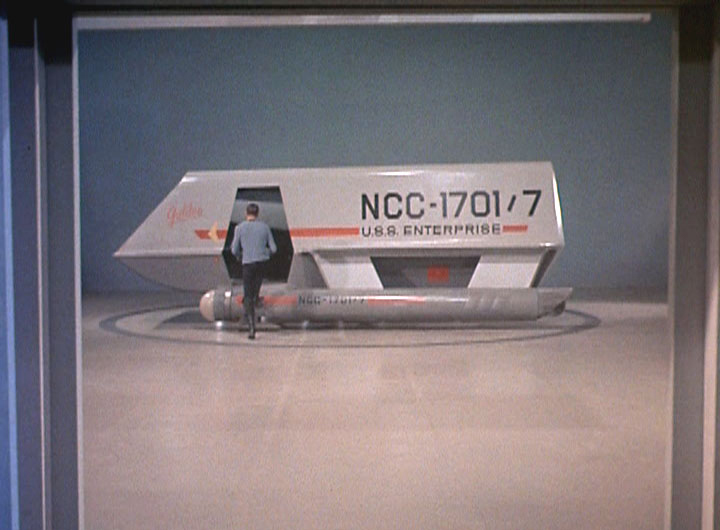 The Galileo was one of several shuttlecraft assigned to the Enterprise. It was designed for relatively short-range journeys, and was suitable for scientific missions, reconnaissance, and personnel transportation. The Galileo could be piloted by a single officer, though in ideal circumstances two officers would fly the shuttle together. If necessary, it could accommodate up to seven crew members. 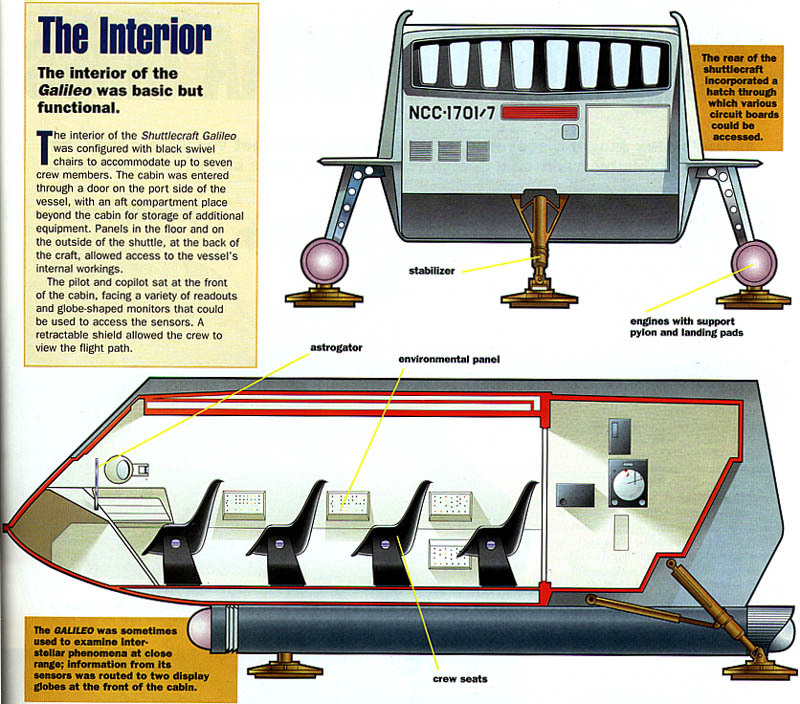 Shuttlecraft such as the Galileo were only suitable for relatively short journeys, as they carried a limited amount of fuel. Their use was limited mainly to travel within star systems or for transport between deep space vessels and planetary surfaces. Typical assignments included transporting diplomats to an from a planet's surface. The Galileo was designed to enter a planet's atmosphere, and was equally capable of landing on difficult terrain or in the shuttlebay located at the rear of the Enterprise's engineering hull. The Galileo carried the basic tools needed for survival on an alien planet, including a medical kit and universal translator. A supply of standard issue Type 2 pistol phasers was also kept in an armory locker drawer. In the even of the shuttle being damaged, it was possible to adapt the phasers to act as a substitute power supply, but this was a dangerous procedure. The Galileo had several important design flaws. Its communications system was extremely susceptible to ionic interferences, and the shielding provided its circuits with only limited protection from radiation damage.